Glutamate Colorimetric Assay Kit | K629 | BioVision, Inc.
Glutamate, one of the two acidic proteinogenic amino acids, is also a key molecule in cellular metabolism. In humans, glutamate plays an important role both in amino acid degradation and disposal of excess or waste nitrogen. Glutamate is the most abundant swift excitatory neurotransmitter in the mammalian nervous system. It is believed to be involved in learning and memory and has appeared to be involved in diseases like amyotrophic lateral sclerosis, lathyrism, autism, some forms of mental retardation and Alzheimer's disease. Glutamic acid is also present in a wide variety of foods, and has been used as a flavor enhancer in food industry. 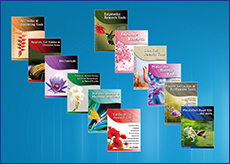 BioVision’s Glutamate Assay Kit provides a sensitive detection method of the glutamate in a variety of samples. 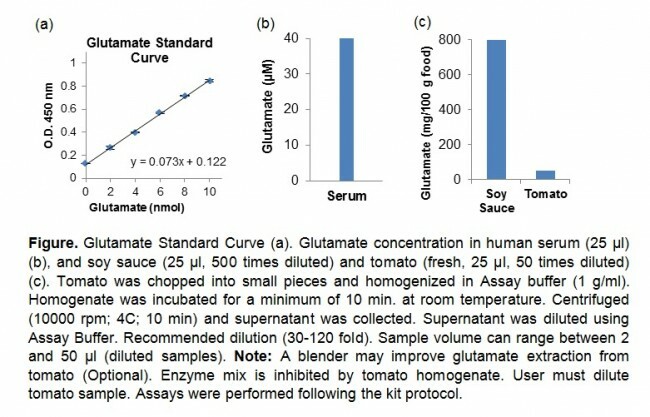 The glutamate Enzyme Mix recognizes glutamate as a specific substrate leading to proportional color development. The amount of glutamate can therefore be easily quantified by colorimetric (spectrophotometry at λ = 450 nm) method. Can this assay only measure free glutamate or can it also measure the amount of glutamic acid in peptides/proteins? This kit measures free glutamate levels only and not glutamic acid in the backbone of peptides/proteins. Does glutamine cross-reat during this assay? 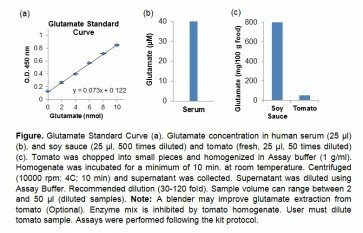 This assay uses enzymatic detection which use glutamate and not glutamine. While using the Glutamate Assay kit to detect glutamate level in Astrocyte cell culture there is an increasing level of glutamate in culture, without adding any glutamate or without changing the culture medium. Why is this happening? Astrocytes release glutamate in a Ca2+ dependent manner. It is a very well-studied function required during transmitter uptake and release. The rate of release can be plotted against time and then a time when release is minimum can be used for the intracellular glutamate assay. Otherwise, total glutamate in medium + cells can be measured. What is the detection sensitivity of the assay? My media contains 0.05mM glutamate and I am looking for changes probably in the nM range. Is there another kit beter suited for this purpose? The kit shows a linear standard curve upto 100uM Glutamate. So 50uM glutamate in the medium should be detectable by this kit. If I run low on developer mix, s it possible to cut the amount of developer and enzyme mix in half and volume up the buffer to still have 100ul per well? If you wish to use only half the Developer volume, it would require scaling down everything into half the volume to maintain relative concentrations.With the decrease in volume recommended here, absorbance values produced should not be directly compared to previous wells that contained full volume since absorbance depends on the path length of light through the sample. Can cells lysed in RIPA buffer be used with this kit? RIPA buffer typically contains SDS which might affect the function of the enzymes in the kit. Hence we do not recommend using RIPA bufefr samples. The assay buffer in the kit also provides optimum conditions for the enzymes to work at their best. Jin et al., Rett Syndrome Microglia: A Mechanism for Mitochondrial Dysfunction and Neurotoxicity. J. Neurosci., Feb 2015; 35: 2516 - 2529. Gu et al., Erythropoietin Exerts a Neuroprotective Function Against Glutamate Neurotoxicity in Experimental Diabetic Retina. Invest. Ophthalmol. Vis. Sci., Dec 2014; 55: 8208 - 8222. Vidaurre et al., Cerebrospinal fluid ceramides from patients with multiple sclerosis impair neuronal bioenergetics. Brain, Aug 2014; 137: 2271 - 2286.